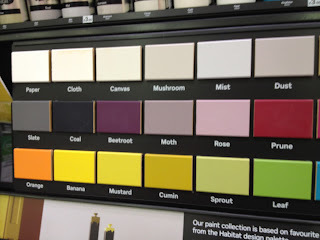 We're doing some decorating at the moment which involves pleasant sessions of looking at colour charts and wondering whether turquoise (the 'colour of the Turk') or bright orange would best lift our spirits as the drab winter months trundle by. 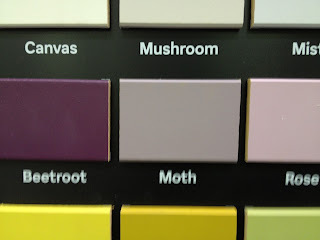 Or what about a colour called 'moth'? 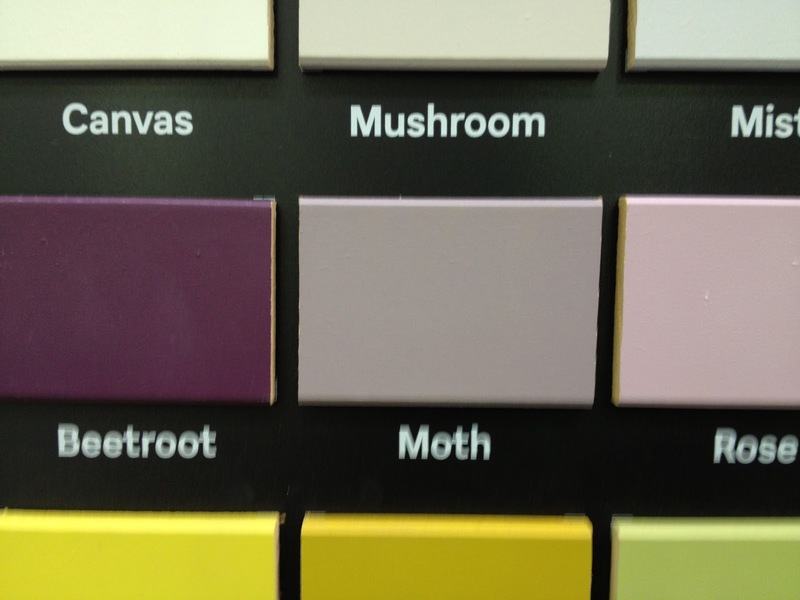 Alas, look how the paint manufacturers cling to the old grey images that moths are all dull and, well, grey. Or brown. Here it is a little closer. 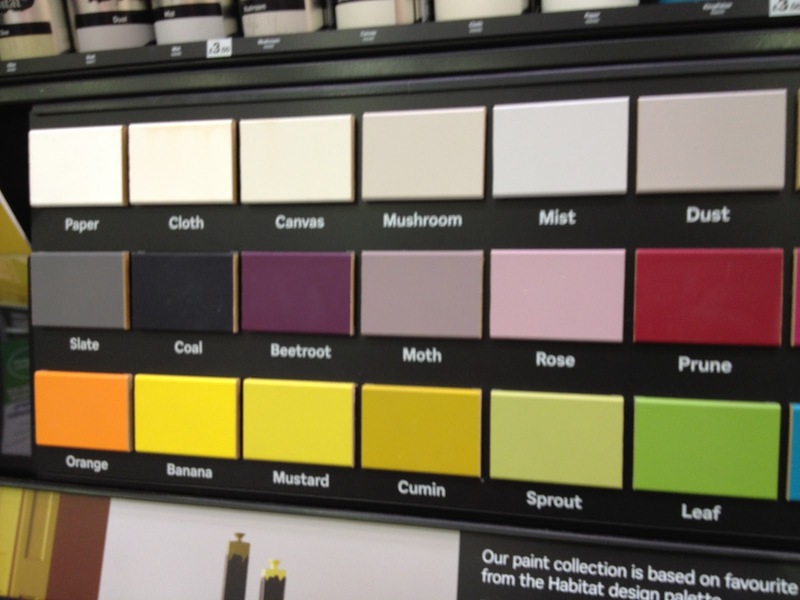 Mind you, this range has a rather subdued feel to it, with other colours labelled Dust, Prune and Sprout - the latter looking more like Old Sprout, wouldn't you say? 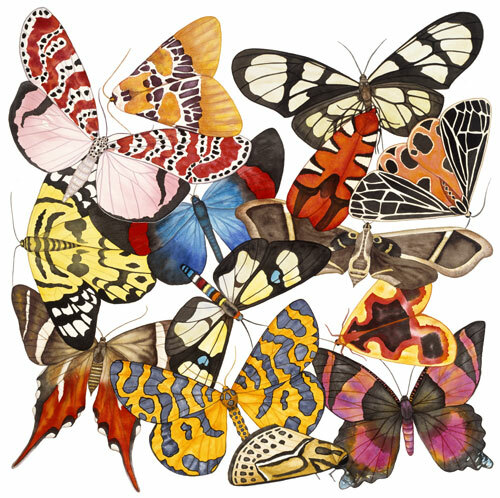 Below, I've found on Google a lovely selection of moths from the excellent website of the artist Lucy Arnold to whom many thanks. That's more like the sort of thing we are after. Too late back last night to put the trap out (and we are mesmerised by the all-action world of Downton Abbey), but hope to be back in action tonight. This is coming to you on a very fragile but gutsy internet connection which has slowly but faithfully downloaded the pictures and signed up to Blogspot/Blogger. But I'd better crack on in case it falls through. You no doubt know the feeling. Just to show some nice photos of this Red Line Quaker (Update: Nope, it's a Red-line - thanks to Ben in Comments), which initially crouched asleep on an eggbox, then tumbled out and lay upside down and comatose, allowing a view of its underwings. Then revived and began exploring a cushion. And I've added a pic of one of the only other two moths in the trap which I'll identify later; I forgot to bring my Moths Bible and I daren't open another tab. Update: I think it's a Brick (Further update: and Ben doesn't disagree). The scarcity of moths after recent good numbers and varieties is entirely due to the weather, I am sure. It has gone very chilly - albeit lovely and clear with fabulous tree colours - and the moths are mostly staying put in wherever it is they roost - tree bark, leaf piles, deep inside shrubs. Previous posts have talked about the time it takes for them to heat up internally sufficiently to be able to fly. I guess that simply hasn't been happening; or they've all had some genetically embedded message that it isn't worth the effort. The lower wing shows rather well in this picture, below, which was unintentional. I gently blew the moth off the rain shield to let it fly away but it was so sleepy that it fluttered down on this rather elderly bit of roofing felt (the black stuff) and sat there with its petticoats showing. Now for a Red-green Carpet looking much redder than the very fine one in yesterday's post, and a Feathered Thorn tucked away in a Happy Egg box. Finally, I know this picture (below) of a second Feathered Thorn under the rim of the bowl is blurred but it's very hard to get good pictures against the treacherously reflective black plastic. The light levels even by 9am are dire at the moment - the red light invariably comes on for flash and I have to suppress it because the glare changes all the colours. I just like the composition and - giving myself airs here - the vaguely French Impressionist look. Well, well. Another lovely catch last night, even though the end of the season is nigh. I am sorry that the poor light in the morning now, plus my wobbly hands, has not done the focussing any favours with these. Tomorrow I will use my long-neglected mini-tripod. ...and then another one, here, on one of my Happy Egg boxes, and these definitely are Mottled Umbers and they are not the same superficially as the first moth. My Bible shows four varieties of the male along with the flightless female, but not one which looks like Moth 1. Still, as I say, I can't see what else it may be. A recessional sense of doom surrounds the moth trap as November approaches. But hold! There are still lovely creatures flitting around. Look at these, for example: a vintage night when all I was expecting was Carpets and Caddis Flies. This is Blair's Shoulder Knot, one of no fewer than three British moths named after a doctor who lived in the Isle of Wight in the mid-twentieth century and trapped new, immigrant species as they ventured over from the continent. That most excellent of MPs, Madeleine Moon, who is essentially the member for moths, has used its name on several occasions in the House of Commons to attract the attention of our former Prime Minister, Tony Blair. It has nice front legs, don't you think, cosseted in long johns. And look at this! A glorious surprise (although I am worried that my camera is on its way out and the beguiling blueish tinge may be a sign of that. This is a Frosted Orange, and it made me very happy this morning. It likes 'disturbed weedy places' and there are plenty of those here. There's more. Here is a Feathered Thorn, probably a male because they are tempted to light whereas the females are more cautious. And a Red-line Quaker alongside a Common Quaker (I think...) No - Update - Wise Dave Shenton confirms in the comments that it is a Brick moth. And finally a snail and - Third Update - Stokelymort brilliantly clocks this as a Brown-lipped Banded Snail in the blog's first ever snail identification; see comments. 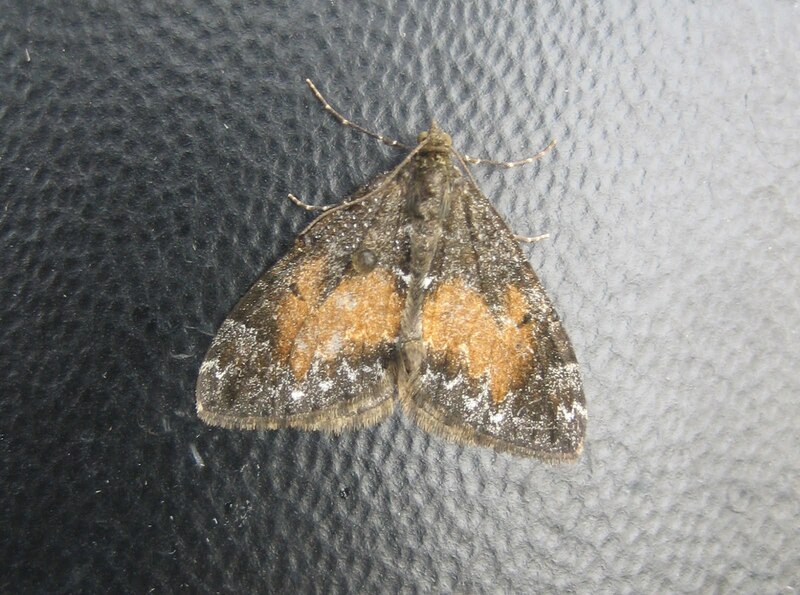 Meanwhile in the background you can see a Spruce Carpet slumbering on the light fitting. Above is the moth world's equivalent of Einstein's equation and last night it was proved true once again. 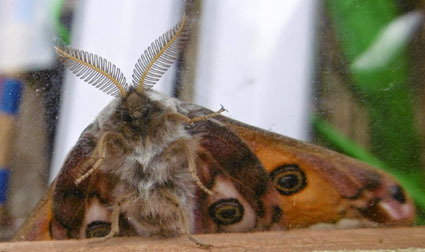 Although parts of the UK coast got a battering from high winds, in the south, and rain, in the north west, Leeds enjoyed a return to early September temperatures and the moths came out. they were not deterred by a fair bit of rain in the early hours, which Mr and Mrs Robinson's moth trap rain shield deflected effectively as usual. How often do I sing a little hymn of praise to that vanished and too little-known pair. I haven't had time to identify the ones here. It's my weekend task, and one which I will enjoy. Of course, if wiser souls can't wait to read my mistakes and want to help via the Comments slot, I never mind. Update: And lo! The kindly Stewart has done just that - see Comments. I promise not to get into this lazy habit, but I append his identifications below in bold, with many thanks (and awe at his skill). I'm just going to double-check the Satellite and then go and examine the trap which has been out again after a misty moisty night. 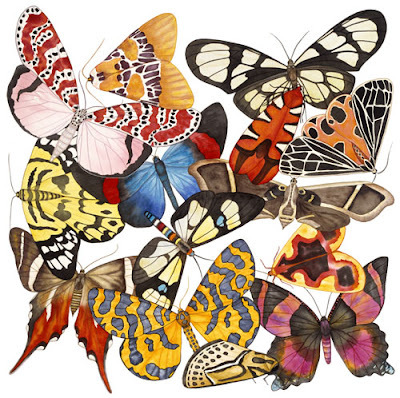 Many thanks again to Stewart and to Banished for his nice link on curious insect positions, in the thread. A very ordinary little moth for you today, but it shows again what beauty there is in ordinariness. I say 'again' because this has been one of the constant lessons of studying moths. As in all walks of life, the obviously beautiful or unusual capture our attention at first; but when there is time to look closely at the 'everyday', all manner of virtues become clear. This is one of the many forms of the Common Marbled Carpet and I had long thought of it as merely a couple of russet splodges on a brown background. But when you look more closely, those little zigzags of white become apparent, along with the small and delicate sprinkling of dots on the upper forewings. It is a modest, common and has agreeably tolerant caterpillars which are prepared to eat anything from bilberries, which sadly we don't have here, to docks which we do, in abundance. It has posed helpfully, too, on the trap's interior, halfway between light and darkness. ...oh, what a wonderful day! Can you beat a sunlit English morning in autumn, with the low, warm light and the glorious colours of the slowly dying leaves? Plus the smell of bacon. It's from the brief but excellent poem Business Girls. Bejeman at his most evocative. Anyway, it's so nice that I will just hastily whack up some pics of moths from the trap last night and then get outside to enjoy it. We are going for a long walk. 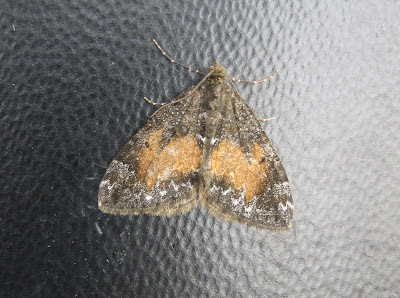 Basically a Carpet, a Quakerish thing, one of the Ys and a Black Rustic. More detail later. Update: I'm back, after a very enjoyable circular walk from Archbishop Sentamu's palace at Bishopthorpe on the edge of York, along the river Ouse flood levee (loads of mud everywhere from last month's inundation) to the old Terry's chocolate factory ,and back on the racecourse. 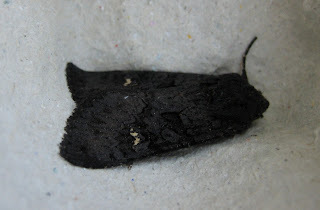 And I identify the above as: a Red-green Carpet (see four or five posts back); a Red-line Quaker; a Silver Y and as previously said, a Black Rustic. Hope I'm right, and Goodnight. I nipped down to make the tea this morning, saying: "I won't be long but I'm just going to check the moth trap." At least twenty minutes later and possibly more, I got back to find a note by the teapot from P saying: "I came down to get mine - hope you don't mind." The moral of this story is that there are still quite a lot of moths around at this time of year, provided that the nights aren't too chilly. Here's a familiar one but well worth another outing on the blog, because by happy chance the camera has caught its violet, indeed almost bluey tinge, a very rare colour in UK moths. It's an Angle Shades, a dashing character with a strikingly rakish appearance which is also very unusual. You, or at least, I, can imagine it sweeping open that folded cloak of its wings and giving you a sweeping bow. It is also unusual in being one of the few of our moths to be around all year, supplemented at the moment by immigrants from the continent. 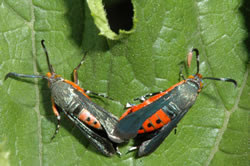 Moths have arrangements similar to those of the modern EU for us, and we all benefit from both. I was up on the moors above Hebden Bridge yesterday on Guardian business, the wild summits where few apart from ramblers and grouse-shooters roam; plus a surprising large variety of wild life which you have to keep a beady out for in the superficially lifeless landscape of peat, heather and bog. I think I have a 'caterpillar eye,' because I spotted this chap straight away, much as I did the Fox Moth ones up in the Lake District four years ago which I described in this post here. 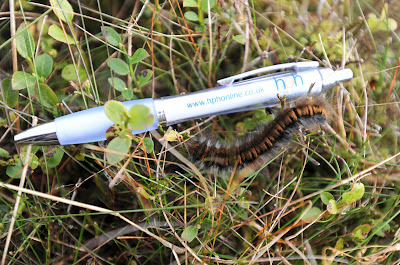 The two are very similar but Tim Melling of the Royal Society for the Protection of Birds, who was with me on the moors, said straight away that this one is a Northern Eggar, the regional equivalent of the more famous Oak Eggar. He also told me that the origin of 'Eggar' is the egg-shaped cocoon which the caterpillar weaves when it is ready to pupate. That time will come soon, and although the weather was lovely yesterday, I would get on with pupating if I was a Northern Eggar caterpillar. 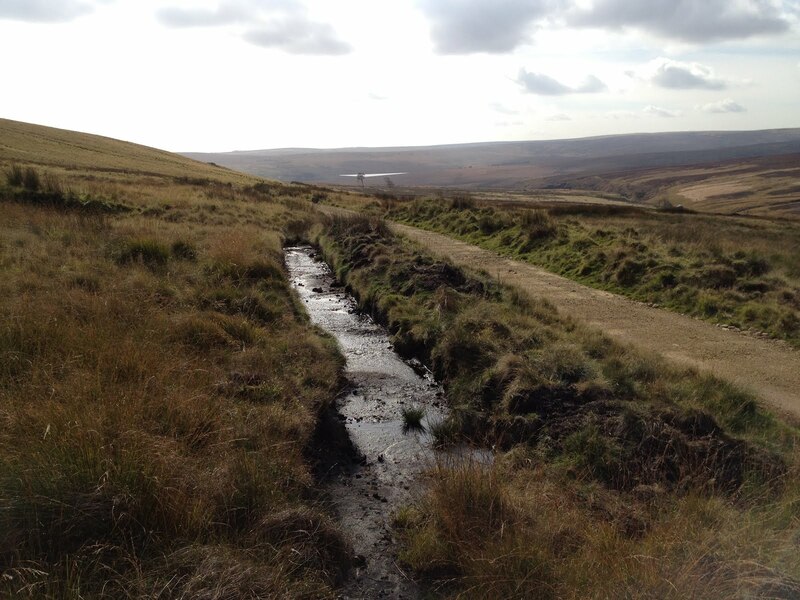 Late autumn weather can be absolutely foul up there. My Penny Wainwright pen scale deliberately advertises the very excellent York accountants who do the business for the Morrell Trust, of which I am a trustee. I always take a bunch from meetings with the enthusiastic approval of the trust secretary Charles Walker, who sensibly says that they're more useful for the firm out in the world than stored in office drawers. This particular one is having quite some outing, both on the roof of Yorkshire and now on the world wide web. Further Update: all may not be what it seems. Is this a Fox caterpillar after all? See comments. Even further Update: Yes it is. See further comment. Isn't this exciting (though I think that's it)?